This children’s book gave me serious pause before I could review it: is it a children’s book or is it best read by adults? It is certainly for older children, particularly high school age. It is a complex, serious book about a very serious topic: war. It asks the questions, What is bravery? What does it take to show one’s bravery? It also indicates that history tends to repeat itself in the battle for power. 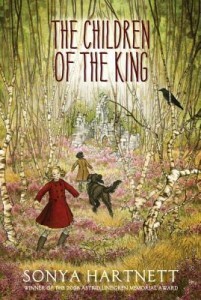 The complexity of this children’s book comes not just from the setting in WWII, but also from the intertwining of a historical tale about King Richard III, Duke of Gloucester. Even without knowing anything of British history, the story within the story unfolds clearly. The entire children’s book does not graphically portray the physical effects of war, but explores its emotional and mental effects. Finally, the book has a mysterious, almost mystical element. In truth, I didn’t figure out the mystery until it was revealed at the end. Perhaps young teen readers would fare better than I did. The book is well-written, filled with beautiful language and memorable characters. Memorable does not mean lovable — one of the main girl characters is a brat through and through, in stark contrast to the other young girl, who is thoughtful and deep. I recommend this book for a high school classroom studying war, history or the craft of writing a children’s book. It is sure to provoke interesting discussions.